Some think of Sunflowers as a Summer flower, but here in the Midwest, their blooms and maturity are all signs that Fall is almost here. Cornfields edged in the brown eyed beauties, bursting forth seeds to feed the hungry birds, can be found in abundance and variety. in a sunflower's brilliant colors of golds and browns. My white ironstone pitcher's bouquet changes with each season. I'm even enjoying my "Sunflower" candle from White Barn Candle Co.
from Spring, to Summer and now to Fall. my kitties are a deterrent. now find that the sunflowers have taken over. Hope you're having a great first week of September! So how about some Fall inspired goodies for a giveaway! and stack of fall inspired notes. all about finding and sharing our inspiration. and Let's have some Inspired Fun! your home now has a fall, relaxed, beautiful look!!! Oh my goodness Debra, you sure know how to put out a fall spread. The sunflower arrangements are so lovely and your vingettes are so well thought out and pretty. Love the silver tray holding the arrangement. Hi Debra, sunflowers are one of my favorite flowers. My youngest daughter usually buys me fresh ones each year for my birthday. I also wanted to tell you about Atticmag's new Link party each Friday called Giveaway Friday!, a convenient place for bloggers to come post about their giveaway(s) each week and a place for readers to learn about giveaways being offered. It's simple; after you put a link up to your giveaway, link back to Atticmag/Giveaway Friday on your blog. I hope you'll join us! The link party goes up on Thursday evenings. 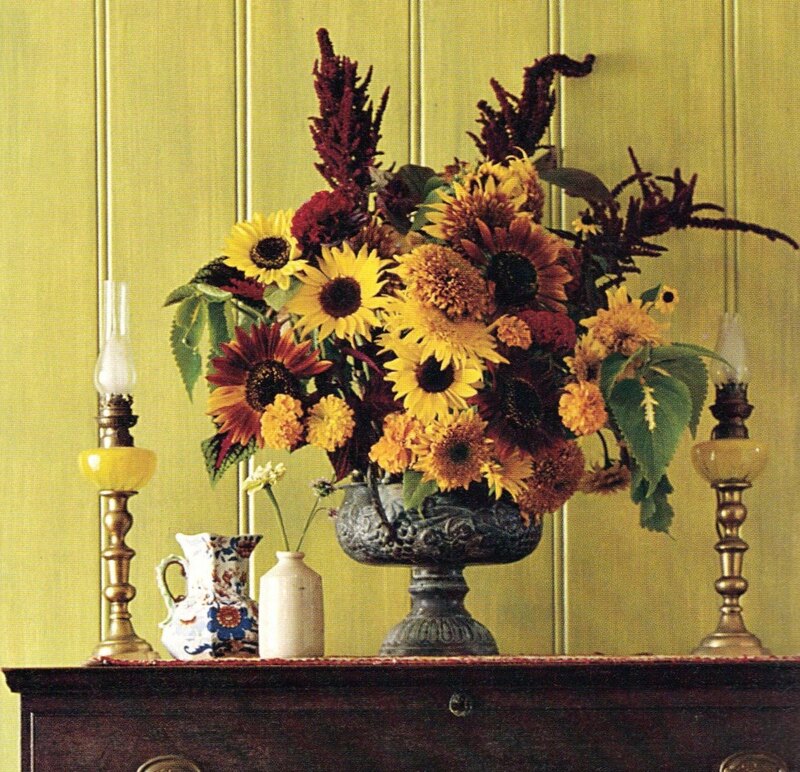 I love the pale yellow sunflowers....they go with my decor a bit better and they look lovely mixed with the darker colors as well. Your arrangements are beautiful! I think Fall is the best season ~ at least here in MN! I really love how you use the same box and change out the insides...a great idea that I may use myself. Thank you for having a giveaway that is perfect for Fall! I just love your charming seed tray vignette, Debra... it inspires me! Sunflowers always make me smile! And Debra - you do too, every time you visit me! Now, what do I have that would inspire someone else so I can join your party? Hmmmm. Nothing, compared to you! 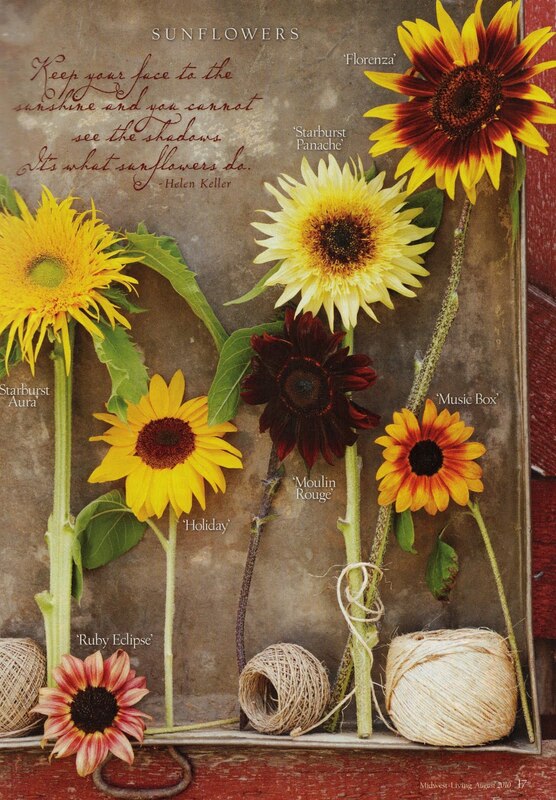 Love the sunflower photos AND that tool box with your sunflowers. They are my fav flower. I have one of those tool boxes without the divides. I may just have to use it with your inspiration! Ohhhhhhhhh Debra, I love all the sunflowers! Aren't Fall colors just Yummy? I needed this event today! Feelin' pretty sick from the dental stuff! Sorry, I posted my Linky twice, I sent the first back to you! I'm blaiming it on My Dentist and the drugs! I love the sunflowers. I am so ready for Autumn and I an so enjoying everyone else's decorations. Thank you for hosting this party. Hi Debra! Sunflowers are abounding all over everyone's blog! Must be autumn's right around the corner, huh? Yours are so bright and cheery and cozy looking. Beautiful arrangements! The deep purple with the yellow is striking! Have a great holiday! How exciting to be here for Week 1 of your new hop! Your sunflowers are so beautiful. Thank you for hosting this party - you have one of the most inspiring blogs around! ...oh I remember gigundous sunflower heads in Ohio ~ and so enjoyed the flavored seeds, sometimes we could even get them covered in chocolate!!! You never fail to deliver (just like FTD) with your seasonal vignettes. You make the changing of the seasons so much fun to watch from the safety of my office! Love, love, triple love the arrangement with the old seed box! Hi Debra, Thank you for inviting me to participate in your Vintage Inspiration party. I have added your button to my sidebar. Your vignettes are always so pretty! Love the seed box and the birdcage. I am itching to start decorating for Fall. I LOVE sunflowers, and of course with your photography skills, your pictures are the best! I'm excited to join in on something new! Thanks for putting this together. i love the start of fall even if we don't have one here. i live vicariously through those that do. that moulin rouge sunflower is so fabulous! Love your idea for a new party. I'd love to join you, but not sure if I have time this week. Let me think on it tonight ans see what I come up with. I will definelty participate in the future and will add your logo on my sidebar. What a neat party!!!! I love it and all of the wonderful links and inspiration that we will all share. You are such an amazing gal, I pray one day I can meet you as well. Thank you for being such a prayer warrior for me. DEBRA... This is My Favorite entry of yours!*!*! Loving ALL the sunflowers!!! I loved to enter but I'm crazed right now getting ready for this weekend's Flea Market Booth... Just Lovely!!! Jeanine, ChiPPy!-SHaBBy! Thanks for stoppin' by! I love the Sunflowers... They are always smilin'! Debra- I joined in on the Vintage Inspiration Link party...I hope I got it all right! This was my first time being part of a link party! Thanks for doing this...some great posts!! 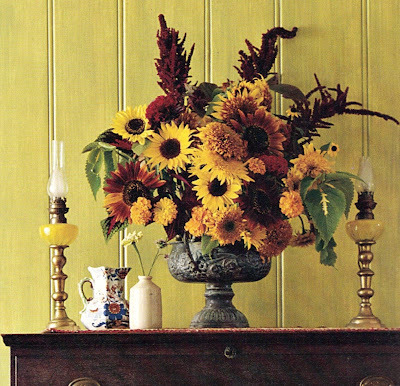 Love the sunflowers and especially in the ironstone pitcher. I'm now a follower and loved being a part of your first Inspiration Friday! just did my first "linky"
Okay my sweet friend. You know I don't usually do these, but this was just too good to pass up. I'm officially signed up! 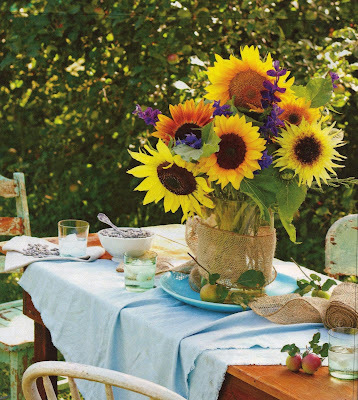 I've never been a big fan of sun flowers, but it seems like they're everywhere in Blogland and magazines right now, and I absolutely LOVE the way they look! Your sun flowers look gorgeous the way you've displayed them!! My favorite is the aqua jars in the white tool caddy... beautiful! Thanks so much for the fabulous "inspiration", Debbie! I had NO idea that there were so many different varieties of sunflowers. One of my favorite stores, Fresh and Easy has them for $5 a bunch. I buy them regularly. I have always thought sunflowers were FALL-ish. I've had the on Fall wreaths for YEARS! Oh Deb I just realized your party was today so of course I'm late....love your sunflower post...I love how their little faces always face the sun...nothing better than sun on your face! I love all of your sunflowers - and I love to decorate for fall too -- seems to me that if I put old Billy Bob Scarecrow out on our front porch the cool weather should follow and fall is officially here! Thanks for more inspiration! The sunflowers are lovely! We always grow a couple of rows in our garden. I try and mix up the different types. I have brought them in before and they look so pretty in vases but they tend to annoy my allergies so I just enjoy them in the great outdoors. I am trying to get a post together to link up to your Vintage Inspirations but I am waiting for hubs to fix a little something to add to the picture. Somethings he just does better than I do. Have a great holiday weekend Debra! I've had your blog opened up on my computer for over a day perusing page after page. I just love your posts. The sunflowers are stunning. The varieties shown in that first photo are gorgeous and I LOVE your seed box. I've added your blog to my sidebar/blog list so I don't miss another post! Debra-It all looks so pretty! Love the seed box. I realized that the book and shops I posted about are filled with all sorts of wonderful "vintage inspiration", so I decided to join your link party after all. I'm going to go add the link back to your lovely party now. I hope you can visit me, it will be a honor. I want to join you in the vintage inspiration so I'm going to publish something about it. Thank you for all this wonderful ideas. Beautiful sunflowers and I love them as a fall flower! In fact, lots of my fall decorations have sunflowers in them! I hope you are having a most wonderful weekend my dear friend! HUGS! I love sunflowers! I think that they are the perfect transition from summer to late summer. I did not know about your party until I was reading Anne's lovely post about you and your blog. I think that I missed it this week, but I will try to jump in next week. Hi Debra, I don't think I have ever commented on your blog before. What a wonderful idea for a linky party. And I love your sunflowers. I was at a farmer's market this weekend and saw lots of different varieties. I may have to grow some next year! Looks like a fun party. I'm trying to look at other peoples posts and see just what it is about. Is it just anything we love and inspires us? Maybe I need to read your post again too. I'll make note of it and try for next week. I think it said weekly. What beautiful sunflowers- they are my favorite flowers and my husband often buys them for me in the early fall. I love the way you use them and place them in decorative boxes and vases. Someone is going to love the soap and sunflower items. Congratulations Debra on your first Vintage Inspiration party! I have been back and forth reading different entries. This is fabulous! I will join up when I have vintage items. Love reading some of these entries. Just a great linky party. So glad you did it. Goodness I have missed coming by to visit you. Honey your home is absolutely wonderful...how warm and cozy. Just lovely how you have it fixed already for fall. Since my accident I have missed visiting a lot of my friends including you. Your swunflower post is wonderfully inspirational! Also a sweet reminder of the midwest...where I lived for 35 years before moving to the east coast. This is a wonderful idea ~ this sharing of inspiration!! I'm off to visit the participants! PS. Your photos are delightful! This is a Wonderful Post on Sunflowers! I was Born in the Midwest and Remember seeing all the different Varieties when I would go back to Visit my Grandparents. My Grandpa Loved taking us for Rides through the Farmlands to Look at the Crops, and these would be all over growing Wild Even!